Spicules give an aphid's head a rugose appearance. Most species do not have them, whereas others have them either dorsally on their heads or both dorsally and ventrally. Dorsal spicules. Focus up and down on the specimen to see if the spicules are present ventrally, as well as dorsally. 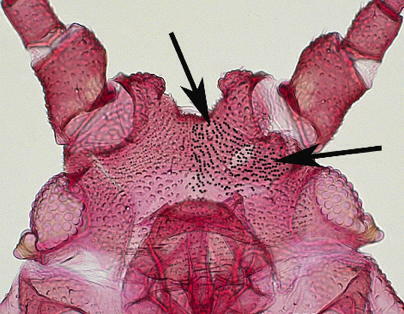 The spicules on the right side of the head have been darkened for emphasis. 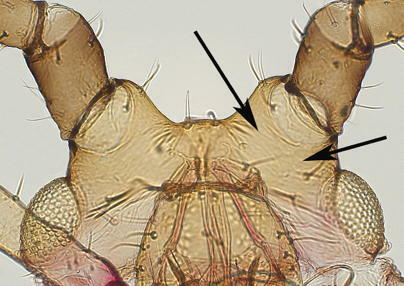 Note also the developed diverging antennal tubercles. 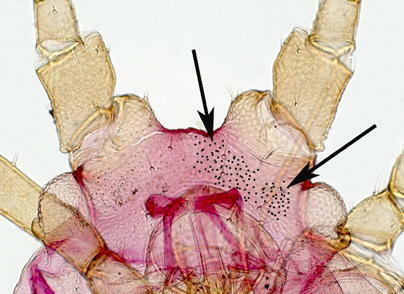 Head spicules are typically found on aphids with antennal tubercles, especially those that are parallel or converging. Spicules can sometimes be quite conspicuous. These head spicules are quite conspicuous, darkened for extra emphasis. Note also the converging antennal tubercles. The absence of spicules makes the aphid head appear smooth. Note the smooth, diverging antennal tubercles.